This was seriously a huge undertaking and a labor of love. I had to recruit my husband and my mother-in-law to help me cut out the letters a few days before Christmas. And then I was up until 3:30 A.M. on Christmas Eve working on it. Since I originally started this TWO years ago, I decided it was time to just get it done! I would estimate I spent around 30-40 hours on it, possibly more. You can see when and where I started on this thing HERE and a shower curtain version I made years ago here. I orginally intended for this to be much larger, but it ended up being about 60 inches by 50 inches. I made 4 panels, and pieced them together with my road, which is 5 inches wide, finished. 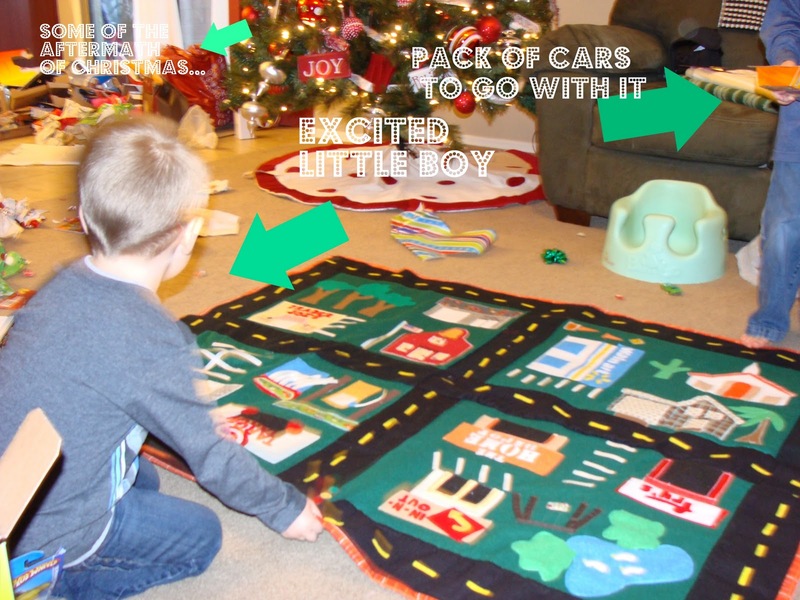 I used felt for the panels and flannel for the roads. If I were to do it again, I would use the same fabric for roads and panels but I would probably NOT use felt. Felt is not really washable, so I think I would use a canvas or denim fabric, something washable. Flannel tends to stretch slightly so that is why I would use the same fabric for both the panels and the flannel. Since I already had a lot of it done on felt and flannel, I decided just to keep it the same. It was a learning experience! I cut out all of the buildings, mostly designing them myself using basic shapes and also looked at some photos when I wanted something more than just a square or rectangle. (Many thanks to the wonderful people who share their great photos- which gave me lots of inspiration.) I also used Wonder Under on just about everything to iron it to the main fabrics, and then I stitched around the buildings after that. To cut out the letters, I printed them off from the computer, then traced them onto Freezer Paper, and then ironed that onto the felt. From here, I cut them out, and then cut them out of Wonder Under. Yep, that is how I do it when I don't own a fancy cutting machine. The freezer paper peels right off the felt when you are done cutting and you don't have any marks on your fabric/felt. I backed this with the same car fabric that I used over the gas station. I also added a piece of white flannel between the mat and the backing, which acts like a thin batting. I stitched in the ditch around all the roads, after safety pinning the thing together, trying to avoid any wrinkles or bumps in the fabric. Next time, I would use spray adhesive, as in the kind for basting quilts...but I was tired so we just pinned it. I then made some binding and quickly machine stitched it on--so it is far from perfect. When you are up on Christmas Eve sewing in the middle of the night, you just want to finish! Since my boys spend a large amount of time on the floor pretending with their cars, I knew they would love it. And I think I was right. 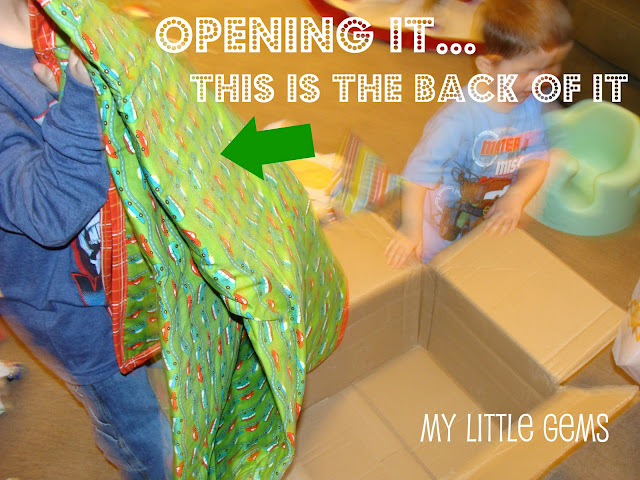 I love seeing my children so happy about something I created for them. I love seeing them happy, period. 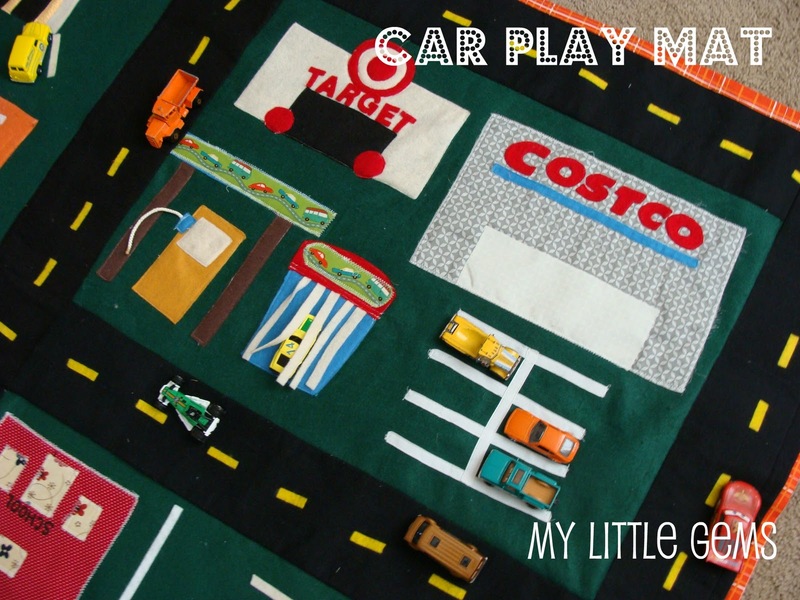 Here are some fun links to some super cute car mats out in blog land. Some of these ladies used glue guns to make theirs. Since I am the queen of glue gun burns, I opted to sew mine. 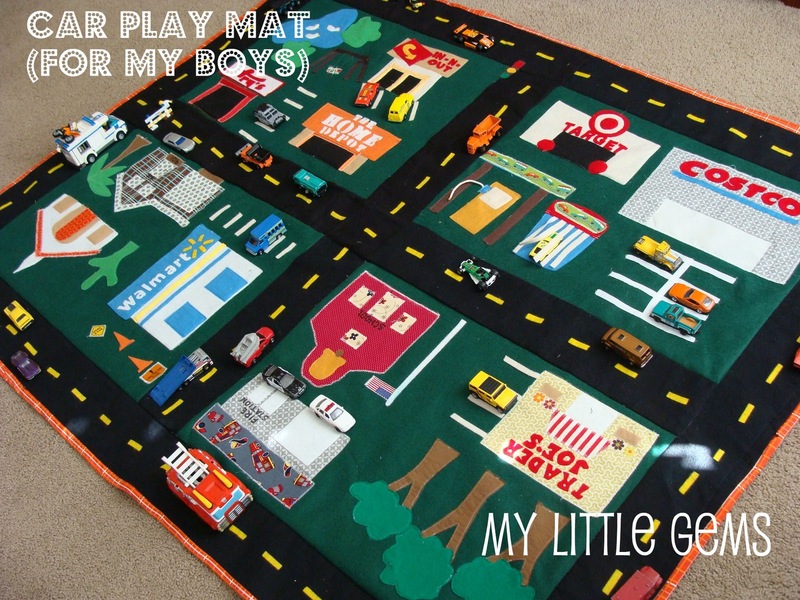 But these are all super cute-so take a peek at some amazing cute car play mats. Happy Holidays everyone! I'm spending mine taking car of sick children....but at least they can play with their cars inside while they recover! Thanks for reading. That is amazing. What lucky little boys you have. I especially love that you included In-n-Out Burger. Just wanted you to know that Allison over at Oopsey Daisy is having a Silhoette giveaway. :) just in case you didn't know! 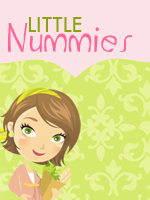 Oh, and I love your blog! One of my very favorites! 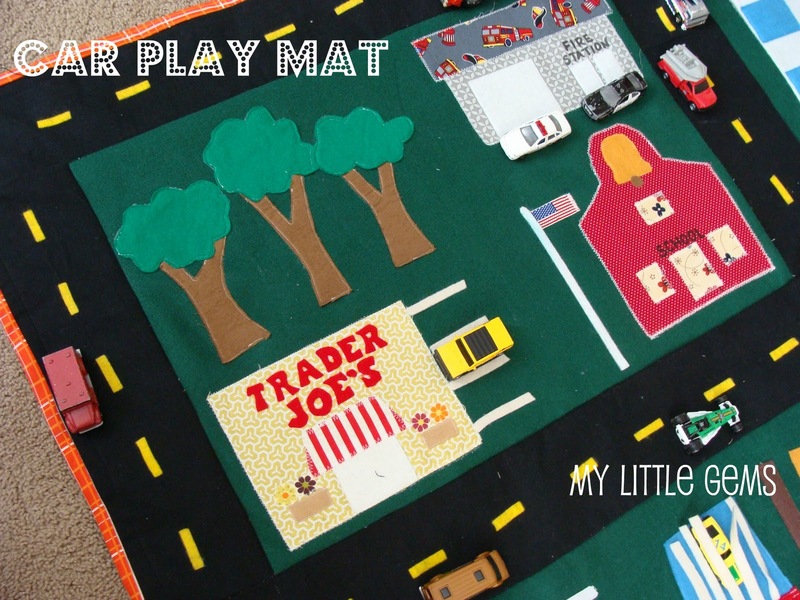 I LOVE how your car mat turned out! It's perfect!! i love this car mat. what an amazing idea. Thanks for sharing! 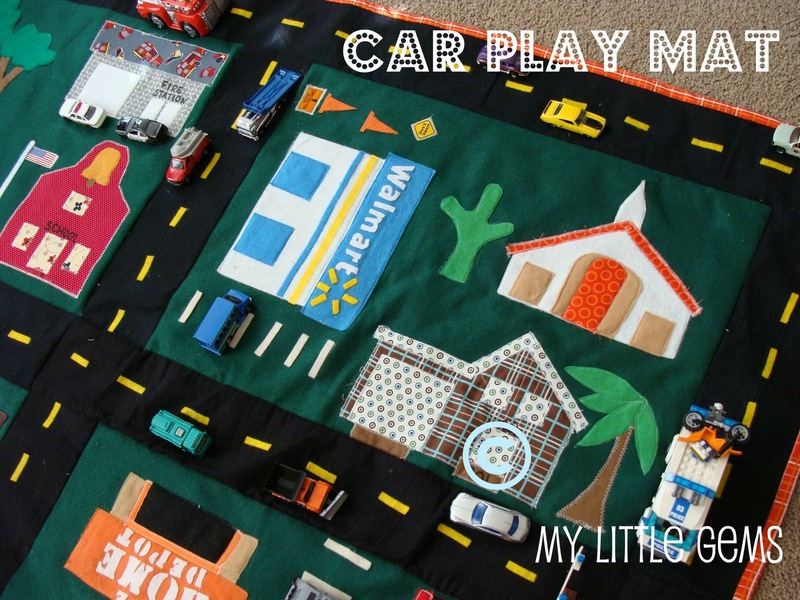 I'm so excited to make a car play mat for my little boy when he gets a little bigger. The way I finish projects though, maybe I should start now so I will finish it before he leaves of his mission. Super cute! I have read this post several times and absolutely love it. I want to make one, but am concerned about how to clean it. You mentioned using material such as denim for the road and ground, but all the buildings, etc. seem to ge made of felt. 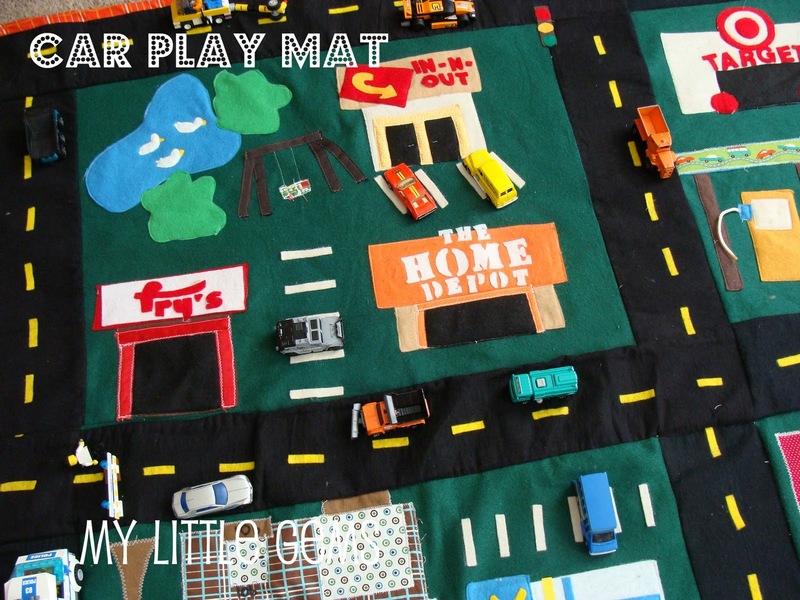 How do you clean your mat. A toddler is definitely going to get this dirty. Judy you can follow me on Instagram at sharsews. I have some car mats there. Those I made with no felt so they can be washed. I’d wash them on delicate and hang them to dry. Judy felt will not wash well as you probably know. But I have made several using flannel and cotton fabrics and they wash fine on delicate and I hang them to dry. If you use felt it will not machine be wash well. I’ve washed this but it did not look as nice and a few pieces came off. Now I make them all machine washable with cotton fabrics.